Back in 2010, most of us were relieved that the outcome of the Chancellor’s spending review was a level funding in cash terms, although the decline in real terms funding since then has been enormously challenging across the board. The forthcoming spending review puts us in an even more dangerous situation. After the 2010 election the Coalition government announced a “ring fence” that protected science spending from cash cuts for the duration of the last Parliament (although this has, as the graphic above demonstrates) translated into real-terms cuts year on year. This time any commitment to a ring-fence from the Conservative government has been conspicuous by its absence. Indeed, its decision to claw back funding of STEM subjects through HEFCE has demonstrated its intention to remove even this modest protection. The government has signalled its desire to cut overall spending massively this time, and there are few places left for the axe to fall other than in research. 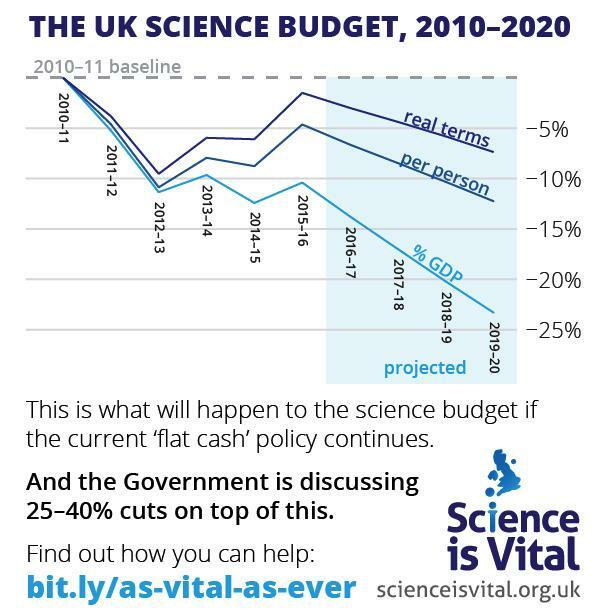 Now the UK’s research councils are being told to budget for cuts of 20% and 40% to their core funding. This will lead to the abandonment of many international research projects and lead to large-scale redundancies across the sector, driving the best of our scientists abroad. These plans are bad not only for science, but for the economy as a whole because it is only through growth triggered by research and innovation that this country can hope to recover from the mess that it is currently in. As scientists and as people who care about this country’s future we can not allow these cuts to go ahead. I will be attending an event at the Conway Hall in London organised by Science is Vital to campaign against these reckless plans. I encourage you to do likewise. I don’t know if the government will listen, but we have to try.